Even though the moniker of Finnish Wolfhorde hints at a bunch of savages, the folk metal played by this troupe reveals some introspective and thoughtful canine species. Neither overly blackened nor outright symphonic nor wildly tribal, Wolfhorde tries to be both traditional and narrative on their first full-length effort Towards the Gates of North. Perhaps in the minds of these Finns this approach will carve them a niche in this tightly populated field. As a result, many songs on Towards the Gates of North take their time to unfold. The journey on the intro Vegvisir starts as a quiet traditional melody with some flute sounds mixed in and slowly becomes voluminous and full-sized. The first half of Fimbulvetr is another stretched out intro with acoustic guitar growing into unhurried, down-to-earth, yet very authentic, riff. Buttressed by keys and symphonic arrangements, combined with sparse deep, slightly muffled vocals, the song is positioned to slow win you over, climaxing into a double bass section around 5th minute. Weaving its tapestry like that, some portions of the album come off as a lot cleaner version of Moonsorrow. Many a song here continues the pattern of Fimbulvetr, hinting at where comfort zone of Wolfhorde truly lies. Full of these stocky burly riffs Unyielding and 9 min long closer Gates of North sway along, with only few tempo pickups here and there. Only rarely the band goes for the jugular, presenting a study of contrasts between slamming and melodic on Boundless Agony, squatting into an awkward brotherly dance on Taivaankappaleiden kato or laying out its heaviest effort on Death Long-Due, where moutharp and accordion carry melody. In a few faster moments Wolfhorde may remind of the old Ensiferum, or go for a total power metal approach with what is by their standards blistering double bass on Lycomania, or play some polka rhythms a la Korpiklaani on Taivaankappaleiden kato. Yet it is rather clear that Wolfhorde is a lot more about reservedly narrated heroic tale than pure unabashed drunken folk. 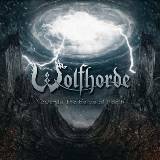 The album did take its time to grow on me, but the composition I kept coming to was The Retribution, where guitars, flute, accordion and everything else in Wolfhorde’s arsenal is thrown at playing a main melody which is guaranteed to tattoo on your brain. Once it engrains, and you understand to feel Towards the Gates of North right at its surface, without trying to dig deep, then you can go right back and enjoy the epic voyage Wolfhorde foster. Sitting back and observing the album quietly, and a bit from the side, will make for a much more accepting reception than waiting to headbang or growl along to some lycanthropic savage trips which never come.